Privé Revaux are proud to have partnered with Jamie Foxx, bringing you a range of eyewear inspired by his dynamic charisma. Whether lending his mammoth talent to comedy, music or film, Jamie Foxx has forged a career around versatility, fearlessness and daring style. This is a man who also knows a thing or two about sunglasses. Whether crooning in a pair of slick shades in the video for Kanye West’s Slow Jamz, kicking back in some 80s frames in Miami Vice, or donning that iconic pair for his Academy Award winning performance as Ray Charles, killer sunglasses have framed his most iconic looks. There is a reason everything we do at Privé Revaux is intimately tied to actors, creatives and celebrities alike. Our brand speaks to improvisation and fluidity - the ability to reframe your persona through eyewear. Throughout his career, Jamie Foxx has embodied this dynamism. Even in childhood, his ability to make people laugh through adopting different voices and telling jokes was evident. His teacher would put his comic skills to good use, allowing his class to hear his rip-roaring acts - if they behaved. So, it was only natural that Jamie kickstarted his career as a comedian, making his name on stage and in sitcoms as a talented new voice. It was here that he first expressed his penchant for fluidity. Originally going under his birth name, Eric Bishop, he noted that female performers were often called first to perform. Thereafter he would be known as Jamie Foxx, a name he felt was androgynous enough to negate bias. From these humble beginnings, he soon found himself the star of his own sitcom, The Jamie Foxx show, before landing roles under prestigious directors Oliver Stone and Michael Mann, in Any Given Sunday and Ali, respectively. But, true to the Privé ethos, Jamie Foxx is not a man who is content to settle. His career has been notable for the way he has consistently reframed himself. A musical virtuoso, he performed memorable vocal performances when recording with Kanye West, Twista and Ludacris, before releasing his own #1 album, the aptly titled Unpredictable. Then came his unforgettable performance as Ray Charles in Ray. Engrossing and magnetic, Jamie showcased both his musical and acting talents in a stunning, charismatic performance that earned him global acclaim, and, later that year, an Academy Award for best actor. Since Ray, Jamie Foxx has pushed on as a bankable yet fearless Hollywood superstar, earning praise for films such as Dreamgirls, Jarhead and Django Unchained. As well as his illustrious music and acting career, he has emerged as a style icon, growing synonymous with dapper suits and daring designs. 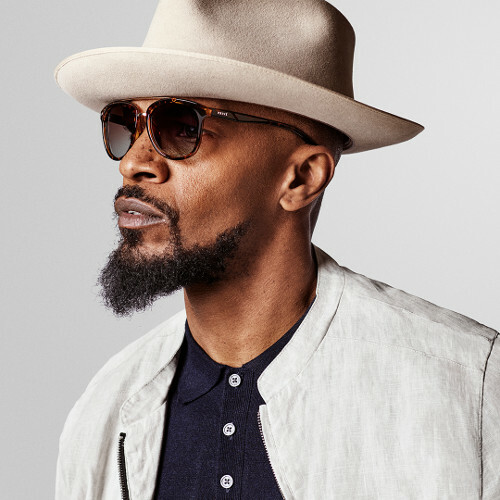 Privé Revaux’s range of men’s and women’s sunglasses have taken Jamie Foxx’s career and personal style as a starting point to create several unique personas. Take The Ace, a design that is larger than life and isn’t afraid to seize the day, evoking Jamie’s connection with soulful, colourful music. Or The Entrepreneur, fearless frames that always have their eye on the prize, sharply dressed for a meeting or an awards ceremony. And, of course, The Explorer, revelling in the unknown, never afraid to step into the blue - as bold and iridescent as the man himself.